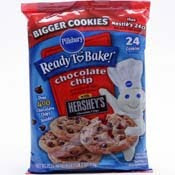 I bought a bag of these cookies yesterday. I made them for dessert for Mr. NWG (Mr. Newlywed Giggles) and I. He ate some, I ate A LOT! He went to bed, I stayed up and continued to eat more and more cookies. Pillsbury is a BAD influence. I can't wait to go home and eat some more! The joys of a weakness for chocolate chip cookies..yummo! I've been know to just eat the dough. Then Hubby doesn't know (and expect) there were cookies in the house. Besides, who wants to wait 10 - 12 minutes for cookies?